Accurate and deadly for the hunt! Sellier Bellot, 7.62x54R, SP, 180 Grain, 20 Rounds is rated 4.8 out of 5 by 27. 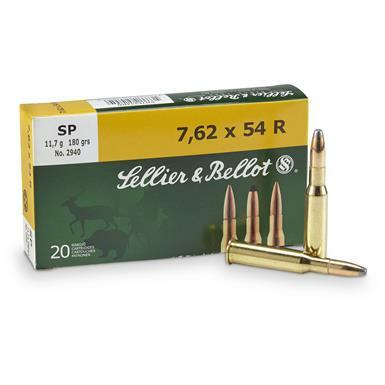 Rated 4 out of 5 by MountieFan16 from Decent Ammo I've found that Sellier&Bellot is loaded close to Military Ammo. Plus, I reload their cases with no problems. The price is good too. Rated 5 out of 5 by Clayton from Works great for hunting. Expanding hunting rounds are getting difficult to find locally so I started ordering ammo from SG this year and have been very pleased with my orders. This is the first year I have decided to hunt exclusively with a few mosin sporters that I have built. So far this is the the best ammo I have found for my type 53 and m44 (my shortened 91/30 preferred 150 gr bullets). I was able to get 1-1.5 moa shooting from a benchrest. On mule deer the bullet passed clear through leaving a 2-3 in exit hole. On elk, I got a head shot at 125 yrds. She dropped in her tracks and never knew what hit her. The bullet passed right though. I have not had any misfires or fliers. This ammo seems to be very consistent and the brass is great. I would definitely recommend this ammo for hunting large game. Rated 5 out of 5 by ogfe1 from hard hitting accurate and deadly! best price around. Rated 5 out of 5 by Kevin from Great Price and Reloadable. Shoots 1 in. 4 shot groups in my Moisin 91-30. Preformed very well on the deer that harvested with it this year! Will by again for sure. Rated 5 out of 5 by ArchieR from Awesome price for quality ammunition. It is getting very difficult to find quality reloadable ammunition in 7.62X54R, for any kind of field application other than range work. Sellier and Bellot fills the bill, and is as reliable and accurate as any on the market. SG has the best prices for it that I've found. The shipping is always quick, and the prices cannot be beat. Rated 5 out of 5 by Dadof9 from Great price on high quality ammo. Great in my Mosin! Rated 4 out of 5 by Chris Taylor from Quality ammo! First 5 shot group about 2inches at 100yrds with finn m39 mosin nagant,this ammo should work well if I do my part.